Sellsy offers a powerful interface to manage your data imports. To import companies or contacts, click Settings then Data Imports. You then arrive in the import management page, which will give you access to the history of your imports. Note: fields in bold are required fields for import. Important: to simplify the preparation of your file, you can download a blank template containing all the expected columns in your account. In the next window, you can configure your import. This is the preferred solution because it avoids any risk of error with file encoding. If your file is okay in Excel (or other spreadsheet), it will be okay in Sellsy. Right after you paste it, it will be unclear and unstructured, but do not worry, this is normal. It will display correctly after it is saved in Sellsy. The alternative is to import a file that you have prepared in CSV format. In that case you can choose the type of file column separator (usually the comma in English versions of Excel) as well as encoding (we advise you to always favor UTF-8 encoding for your imports). Once your data ready, click Analyze Data. Your data is displayed in columns. The green columns were directly recognized by the system; there is nothing more to be done. By clicking on the drop down menu you can choose not to import the column (which is displayed in gray). You can also choose one of your existing fields in Sellsy, and the column will then turn green. When all your columns are green or gray, you can import your file. Note: You can manage the selection of the columns with one single click, above listing, if you are okay with only importing the columns that ready. Before importing your data, you can set a number of parameters if your file is an update of your existing Sellsy file. The comparison fields allow you to check if data already exist in your account and update it accordingly. Important: If you choose several comparison fields, the system will find comparisons only if all the fields are found. Otherwise, a new record is inserted. 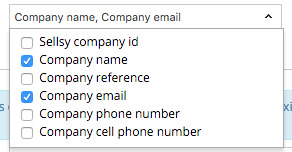 For example, if you changed the name of a company, do not choose this field for comparison. Good to know: Sellsy identity numbers are automatically created when the object itself is created in Sellsy. So you can only recover that information with an existing data export. Do not fill this column when you import new data. These actions allow you to choose what to do when a match is found. If the data does not exist in Sellsy, you can choose to insert a new record or not. For example, if you import an update and the file contains a company that does not already exist in your account, you can choose to create it or not. If the data is found in Sellsy, you can choose to update the record or not. If a cell in your file is empty, you can choose to overwrite the value or not. For example, if a phone number has been entered in the Sellsy contact but not in your update file, you can choose not to change existing data in your account. Finally, for smart tags, you can choose either to merge smart tags in your file with existing smart tags on Sellsy, or replace them completely. Similarly, you have options on what to do for custom fields. If a mandatory custom field is empty, you can choose to import the line leaving the required field empty or not to import the line. If a list type value does not exist, you can choose to create it or not. For example, if you have a custom field list containing the values North, South, and East on Sellsy and your import contains the value West you can choose to automatically add the value to your custom field. If a custom field cell in your file is empty, you can choose to automatically add the default value defined in your account, or do nothing. Your import is now running, you are redirected to preview your import. During treatment, your import is marked as waiting for processing. In the same place you will find the characteristics of your import. The first button allows you to cancel the import before it is processed by the system. The second allows you to cancel the changes and roll back to the original state before import. The third allows you to download the import file in Sellsy format. Finally you can download the error file to check lines that have problems.